Enteral Feeding Devices Market to Reach $2,720.8 Million Growth, Analysis & Opportunities by 2020: Grand View Research, Inc.
San Francisco, United States, 2018-Nov-08 — /EPR Network/ — The global enteral feeding devices market is expected to reach USD 2,720.8 million by 2020, according to a new study by Grand View Research, Inc. Growing global base of geriatric population and increasing prevalence of chronic diseases such as diabetes mellitus and pre-term births are some key factors expected to drive market growth over the next six years. The introduction of cost effective, portable and technologically advanced products such as low profile gastrostomy devices is also expected to accelerate the market penetration rates of these devices in emerging Asia Pacific and Latin American markets. Furthermore, the establishment of initiatives such as Stay Connected 2014 aimed at elevating user and patient awareness levels and facilitating the use of safety measures in the enteral feeding process is expected to present significant growth opportunity for industry participants. Enteral feeding pumps dominated the overall market in terms of revenue share on account of their high market penetration and usage rates, with market revenue estimated at USD 1,115.3 million in 2013 and expected to grow at a CAGR of 6.4% from 2014 to 2020. Europe was the largest regional market, with estimated revenue of USD 634.2 million in 2013. The presence of high prevalence of diabetes mellitus and other chronic disorders affecting the gastrointestinal system and a large base of geriatric population in this region attributes to its large market share. North America followed Europe in terms of revenue share in 2013 at over 30.0%. High patient awareness levels, sophisticated healthcare infrastructure and high healthcare expenditures are some of the factors expected to serve this market as drivers. Asia Pacific enteral feeding devices market is expected to exhibit the highest CAGR over the next six years owing to attributes such as the presence of high unmet medical needs, constantly improving healthcare infrastructure and patient awareness levels in countries such as India and China. Its market is expected to grow at a CAGR of 6.7% from 2014 to 2020 to reach USD 770.6 million by 2020. The demand for percutaneous endoscopic gastrostomy devices and nasogastric tubes is expected to grow at a CAGR of over 5.6% and 5.2% from 2014 to 2020, respectively. 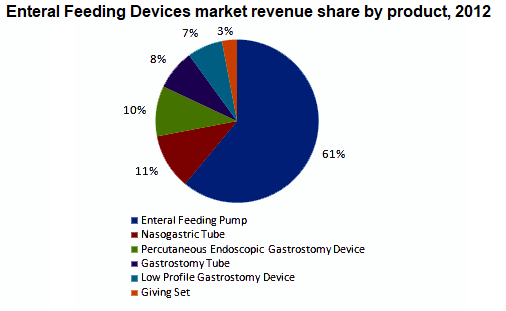 Gastrostomy tube market revenue is expected to reach USD 206.3 million by 2020. Key industry participants include Abbott Nutrition, Danone, Nestle, Fresenius, Boston Scientific Corporation, Kimberly Clark Corporation, Covidien Plc and Conmed Corporation.